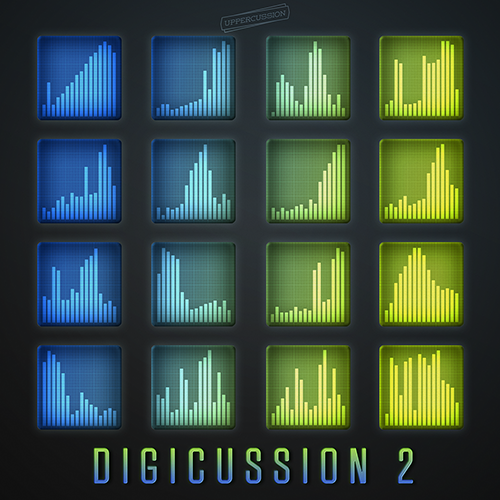 Digicussion 2 is a large synthetic drum kit library composed of hard kicks, twisted snares, ambient stabs and complexly interacting layers and was created using high fidelity synthesis and sampling techniques. The kits in Digicussion 2 are concise and playable, designed to provide inspiration for creative rhythmic input for music of all styles. Formats include Maschine 1 & 2, Ableton Live Pack*, MPC, FL Studio, Battery 3 & 4, Geist, Kontakt (basic), EXS24, Halion, NN-XT, and single WAV samples. Sample folders are separated by sound type. Total size is 165 MB. *The Ableton Live Pack of Digicussion 2 is included with Live 9 Standard and Live 9 Suite and is not available separately.